Photography by Dan Piassick Taken from the nit and grit of city life along with charming and romantic elements comes Urban Glam. All the way down to the color we have shown what can be when you combine two very opposite styles into one. When creating the design we focused on a balance between the two styles with material choices and elements throughout the space. The urban style is shown in a few select pieces, first is the custom shelf that was inspired by the Chinese symbol for the phrase “To Create “. This piece has straight, heavy lines and is done in a dark concrete gray color which gives it a great urban feel. It creates space for a few worthy pieces to be placed upon it but itself is the main art piece. 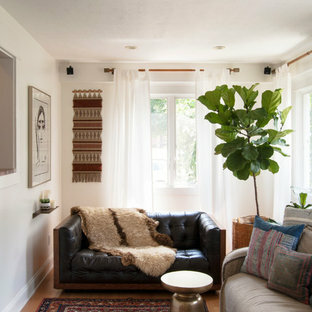 The phrase “To Create” can be both urban and glam. It’s urban in the way that we’ve created the city and everything in it, from the buildings to the cars that drive on the roads. 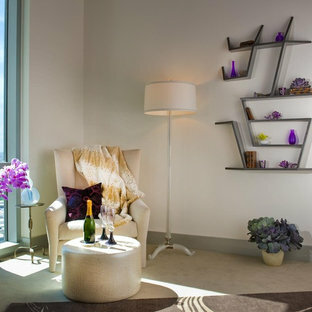 However, you can create something glamorous as well, so the meaning of the shelf supports both styles. The second urban element is the wall of acid etched mirrors. They have a nitty-gritty feel to them like that have been around for a long time. The lighting element in this room is very glam, not only is the chandelier adorned with jewelry, amethyst and clear stones but the glam continues up to the ceiling around the chandelier with beautifully draped fabric. The tufted velvet headboard also screams glam in a romantic, luxurious way. Other important elements in this Urban Glam room are the beautiful glass art pieces, the matching ivory beauty desk and bedside table, and the wool and silk rug that grounds the whole space. The attached bath continues the glamourous style with upholstered walls and hand blown glass pendants in rich purples. The mirror above the sink is made from hand cut glass giving it a rough look but the pattern it is placed in a very elegant way. By combining the nitty-gritty feeling of a city and a charming, romantic air we’ve created the concept Urban Glam. Since this space is in a high-rise condominium located in a downtown area it already has the Urban environment surrounding it and by making it luxurious and romantic it will also be comfortable to live in. 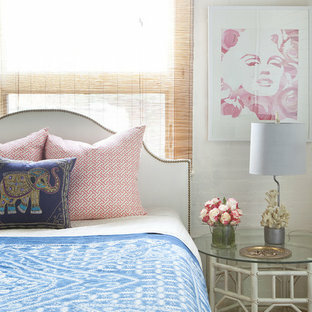 The nailhead/upholstered headboard is from Urban Outfitters, the Marilyn print is from Cozamia http://cozamia.com/gallery/Marilyn-Monroses.htm The Pillows are from Caitlin Wilson http://caitlinwilsontextiles.com/?p=product&sku=48&d=1&pre=p!category|c!pillowcovers|patt!|s!|fabric! Photography by Robert Peacock Taken from the nit and grit of city life along with charming and romantic elements comes Urban Glam. All the way down to the color we have shown what can be when you combine two very opposite styles into one. When creating the design we focused on a balance between the two styles with material choices and elements throughout the space. The urban style is shown in a few select pieces, first is the custom shelf that was inspired by the Chinese symbol for the phrase “To Create “. This piece has straight, heavy lines and is done in a dark concrete gray color which gives it a great urban feel. It creates space for a few worthy pieces to be placed upon it but itself is the main art piece. The phrase “To Create” can be both urban and glam. It’s urban in the way that we’ve created the city and everything in it, from the buildings to the cars that drive on the roads. 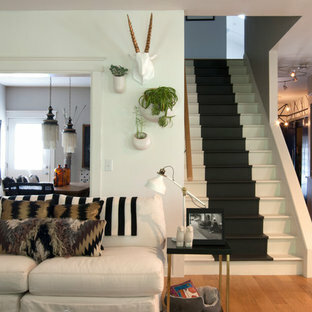 However, you can create something glamorous as well, so the meaning of the shelf supports both styles. The second urban element is the wall of acid etched mirrors. They have a nitty-gritty feel to them like that have been around for a long time. The lighting element in this room is very glam, not only is the chandelier adorned with jewelry, amethyst and clear stones but the glam continues up to the ceiling around the chandelier with beautifully draped fabric. The tufted velvet headboard also screams glam in a romantic, luxurious way. Other important elements in this Urban Glam room are the beautiful glass art pieces, the matching ivory beauty desk and bedside table, and the wool and silk rug that grounds the whole space. 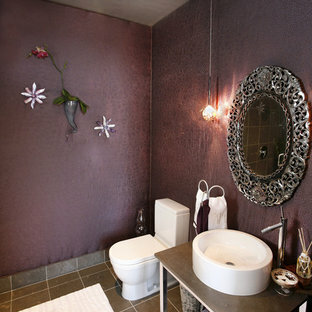 The attached bath continues the glamourous style with upholstered walls and hand blown glass pendants in rich purples. The mirror above the sink is made from hand cut glass giving it a rough look but the pattern it is placed in a very elegant way. By combining the nitty-gritty feeling of a city and a charming, romantic air we’ve created the concept Urban Glam. Since this space is in a high-rise condominium located in a downtown area it already has the Urban environment surrounding it and by making it luxurious and romantic it will also be comfortable to live in. A custom-cut piece of glass tops a Saarinen tulip table base framed by a curvaceous silk-velvet settee and a wood bench stands in place of a conventional dining set in the dining area. “I didn’t want the clutter of a lot of chairs” Jane says. “It would have interfered with the calm of the room.” Timber bamboo, lustrous overscale Vietnamese pottery, a trio of sparkling Thai mirrors, and nearly a dozen candles interspersed with smooth dark stones enhance the dining area’s grown-up appeal.